The frigid air this week was too much for the mums and pretty much all the flowers. It occurred to me that these mums which were bowed down low and began to turn brown with the cold snap would still look good in black and white. It is interesting to me how you can't even tell they are browning without full color. I always think mums are for the optimist where I live because the odds are it will either get too hot if they are planted too soon or they will get frozen if planted too late. These mums were planted in a public garden on the late side and the buds barely opened before they were frozen. Click here for the weekend in black and white and here for Today's Flowers. They seem to come alive in black and white. Nicely done Carver. Stay warm this weekend. You are right, I couldn't tell that these flowers were dying. Great idea using B&W. Have a nice weekend, Carver. These flowers look like grand littlle ladies in black and white. They look beautiful, and the light is lovely. They look really good in b & w. Happy weekend to you. How smart of you to think of this! They look perfect and perfectly elegant in B&W ....... wonderful idea. So lovely! Like the black and white theme. 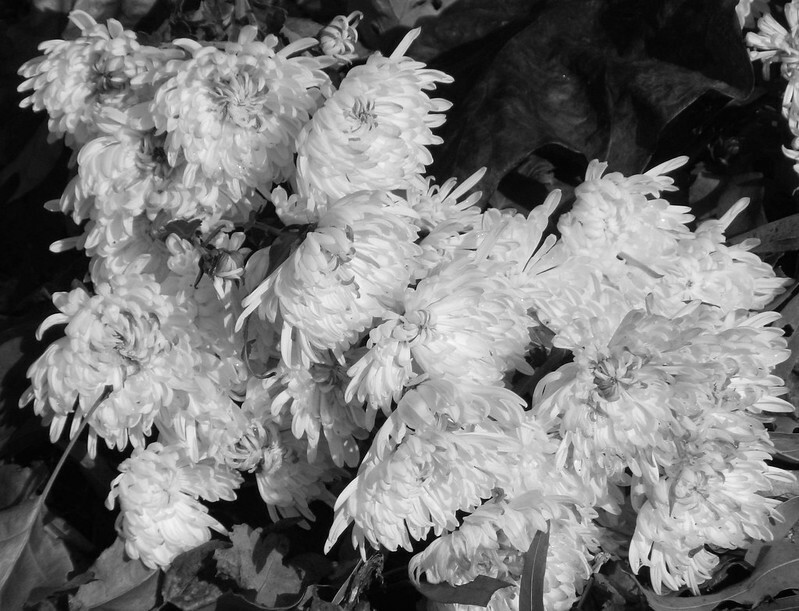 wonderful photo in B&W of these lovely flowers! Pretty in black and white, yes! You're right - they look so fresh in b&w! Great shot.